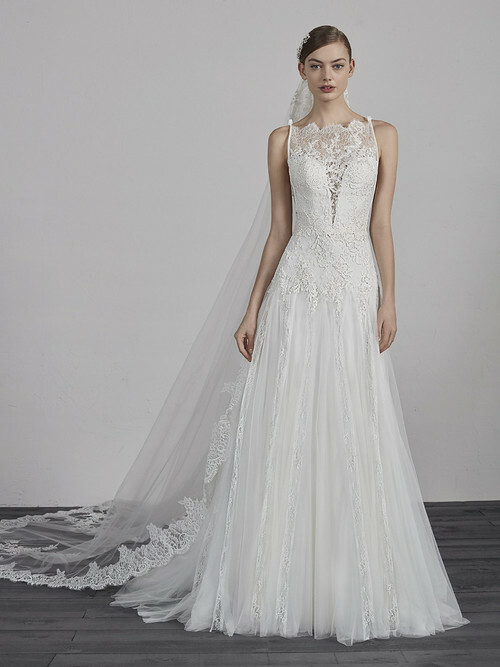 Marvelous romantic-style dress with an evasé skirt, fitted at the natural waist, made with multiple layers of soft tulle and godet appliqués in Chantilly that blend in with a spectacular bodice, crafted entirely in Chantilly, with guipure appliqués and beaded details. 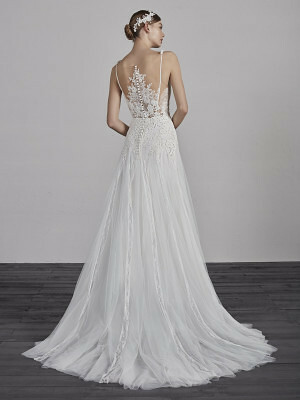 The illusion neckline with blonde lace over a V-neckline plays with the illusions and second-skin effects, which are accentuated on the back, in crystal tulle, by thread-embroidered appliqués that ascend in the middle of the back to create a spectacular floral decoration. The detail of the slender straps with bows and the tattoo-effect give it a very special sensual touch. Shown in Off White. Available in Off White/Crystal, or Off White.